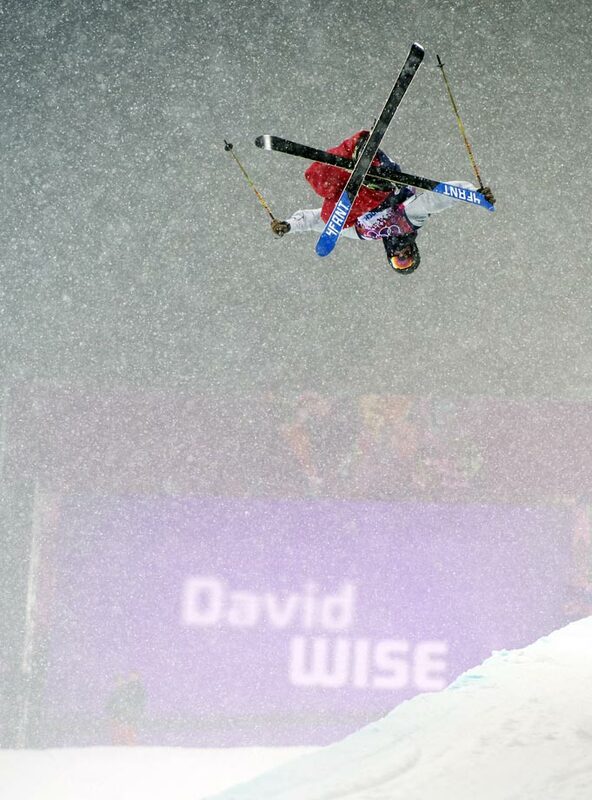 David Wise of the U.S. wins gold in the Ski Halfpipe. 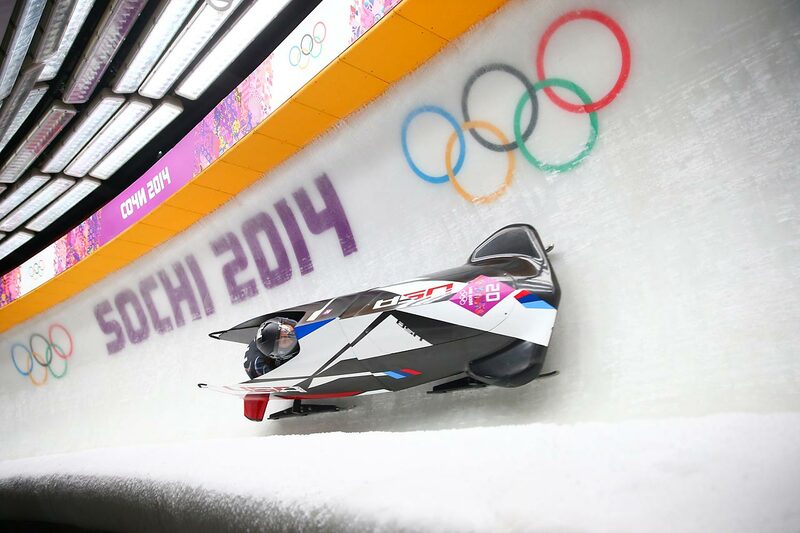 Wise soared through snow and sleet, and waterlogged conditions, to win another gold for the U.S.
Elana Meyers and Lauryn Williams of the United States compete in the bobsled competition. 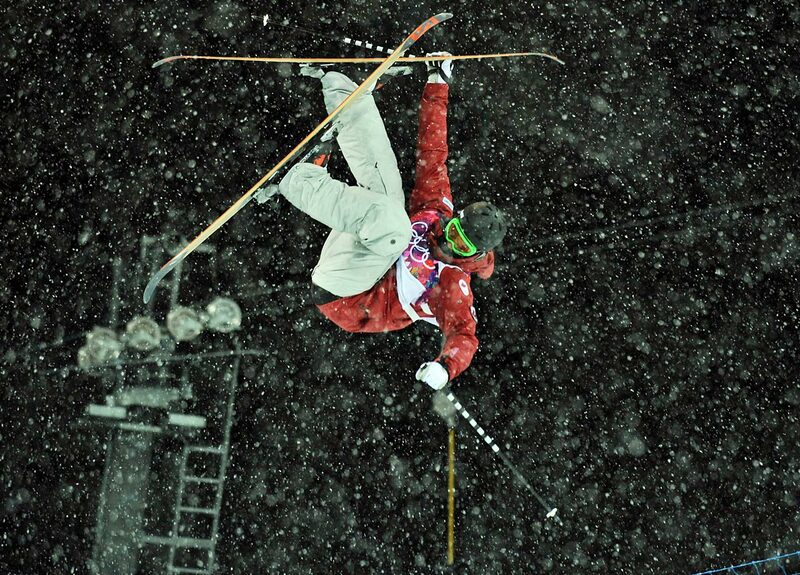 Mike Riddle of Canada looks to land his jump during qualification for the ski halfpipe. 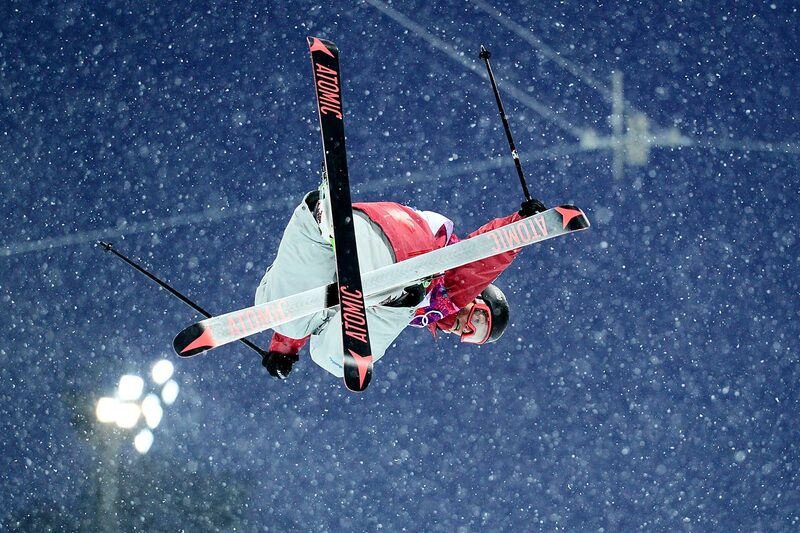 Noah Bowman of Canada flips during qualification for the ski halfpipe event. 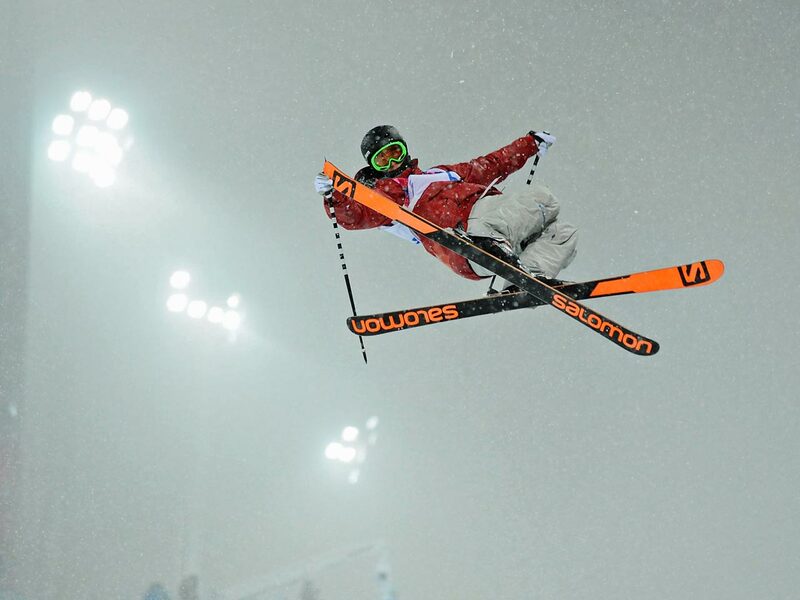 Canadian skier Mike Riddle flies through the air during the ski halfpipe qualification. 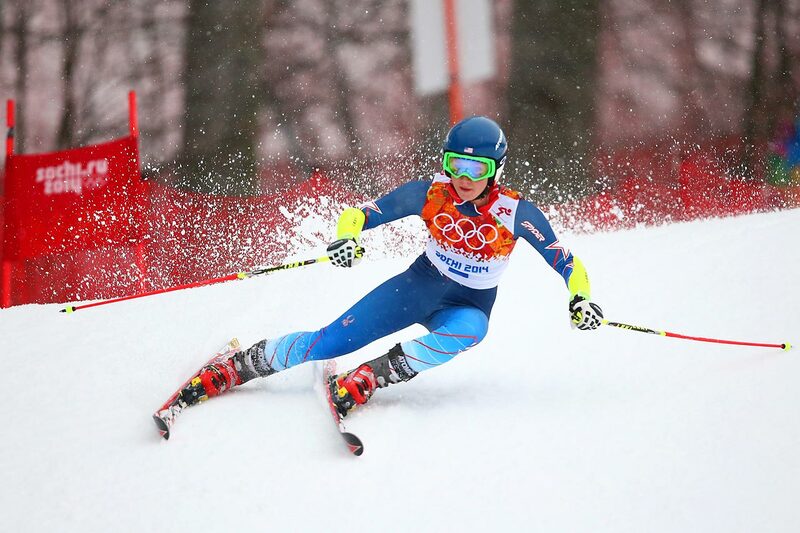 American skier Mikaela Shiffrin takes her first run in the alpine skiing women's giant slalom competition. 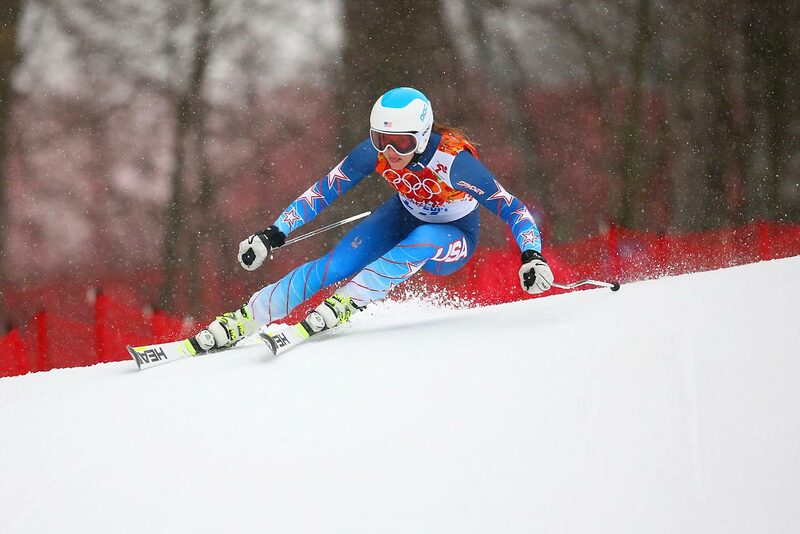 Julia Mancuso of the United States competes in the alpine skiing women's giant slalom in Sochi. She did not finish her run after missing a gate. 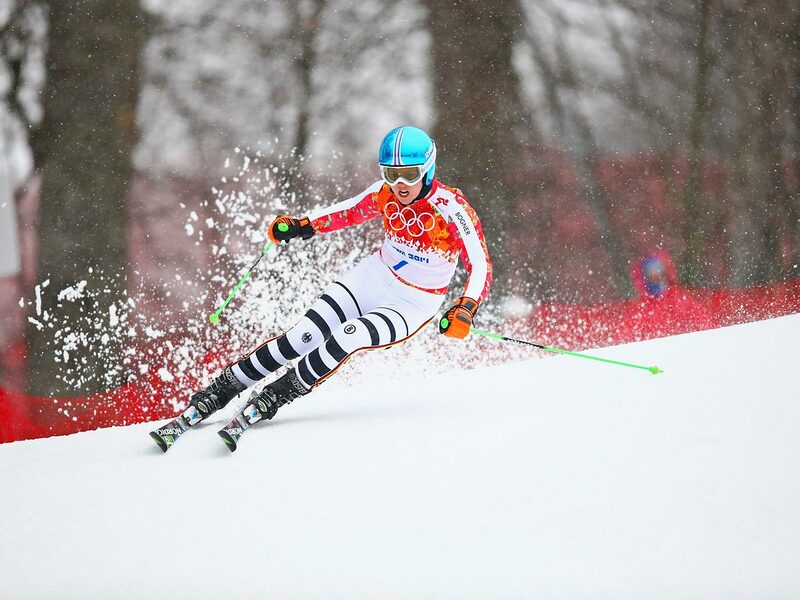 Vikotria Rebensburg of Germany races downhill during the women's giant slalom. She earned a bronze medal in the event. 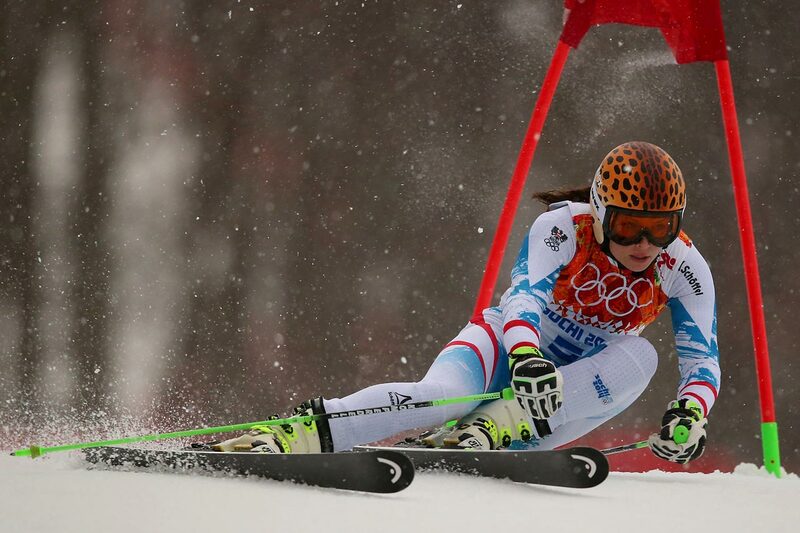 Mancuso missed a gate during the women's giant slalom competition and failed to finish her run. 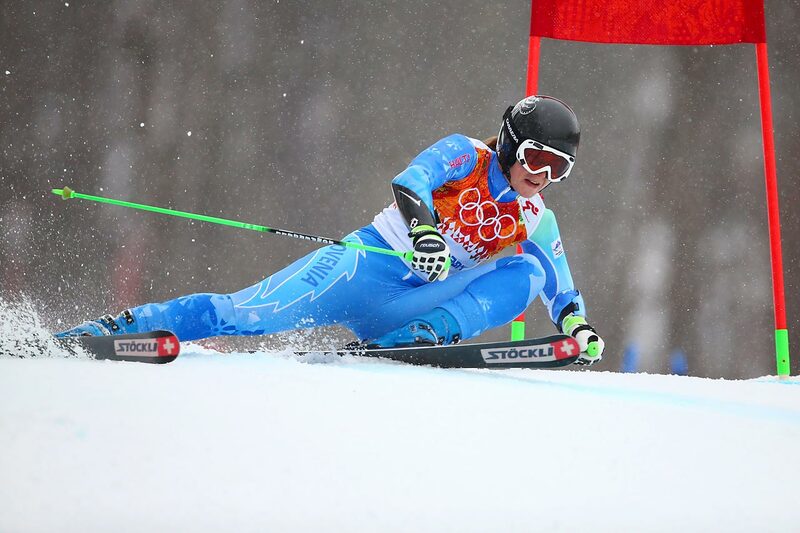 Slovenian skier Tina Maze wins gold in the giant slalom competition. 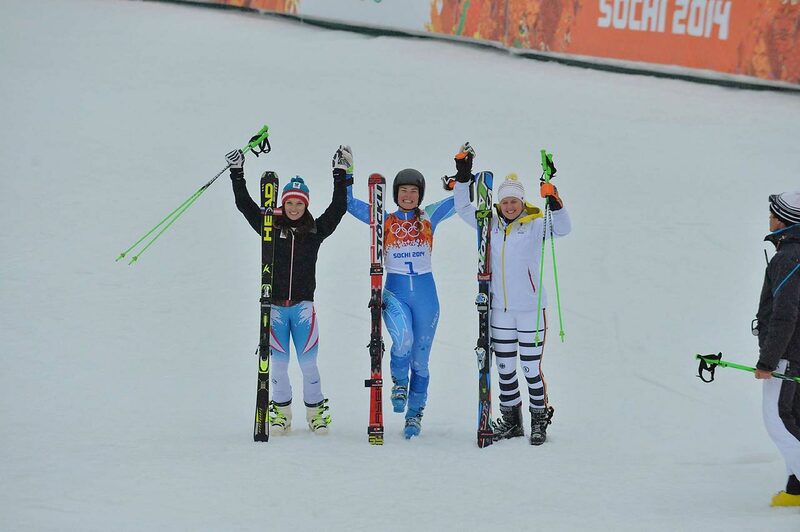 Anna Fenninger of Austria won the silver, Tina Maze won the gold and Viktoria Rebensburg of Germany won bronze. Norwegen Skier Nina Loeseth takes her first run in the alpine skiing women's giant slalom competition. 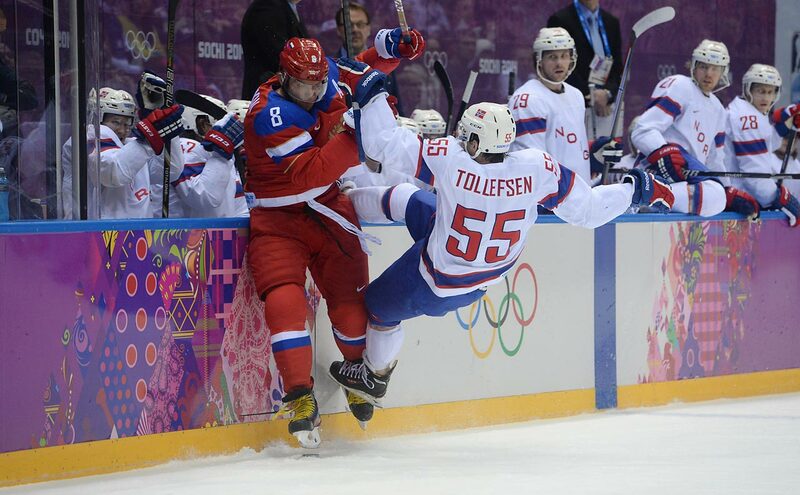 Alexander Ovechkin of Russia blasts Norway's Ole-Kristian Tollefsen to the ice during a 4-0 qualifying round victory for the Russians. 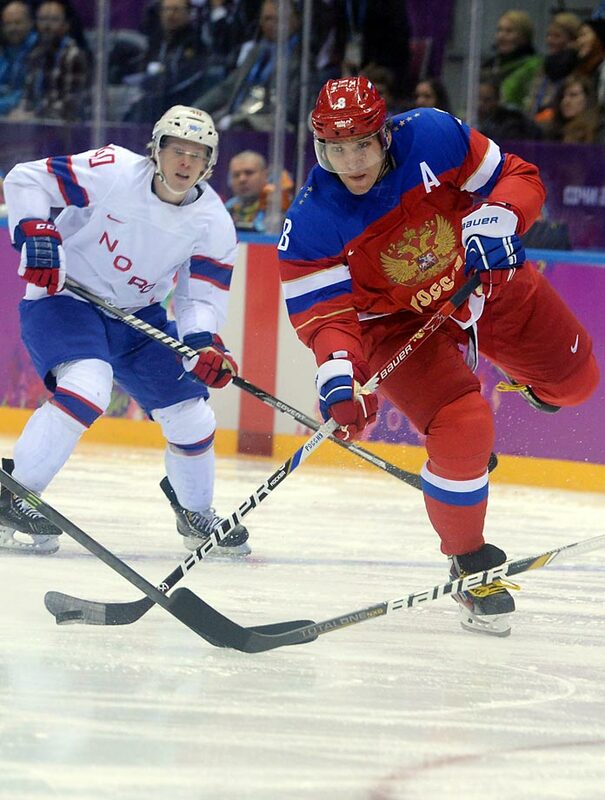 Russia's Alexei Tereshenko evades Norweigen defenders during a qualifying round Olympic hockey game. Russia won easily, 4-0. Alexander Ovechkin of Russia showers Norweigen goaltender Lars Haugen with ice during Russia's 4-0 dismantling of Norway in the qualifying round. 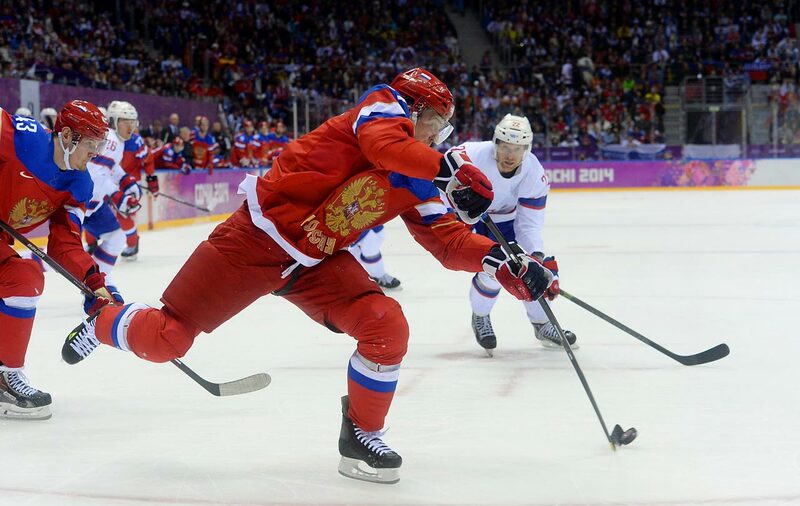 Russia's Alexander Ovechkin looks to shoot the puck during a 4-0 victory for his team over Norway. 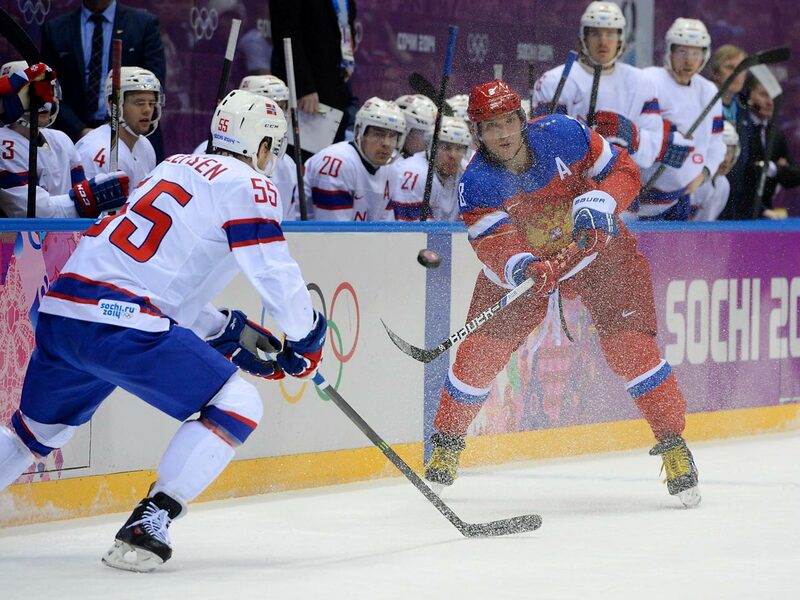 Russian Alexander Ovechkin hurls the puck down the ice as Ole-Kristian Tollefsen of Norway defends. A Russian fan watches her country compete in the 2014 Sochi Games. 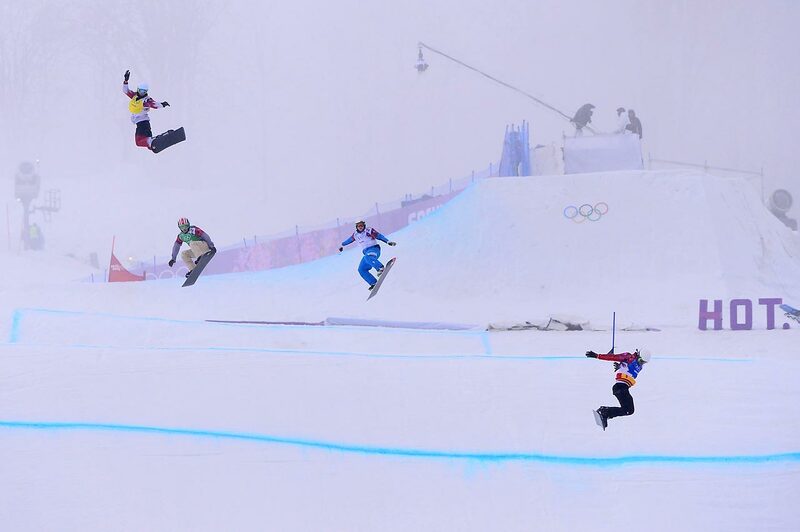 Riders take a jump during the men's snowboard cross finals. 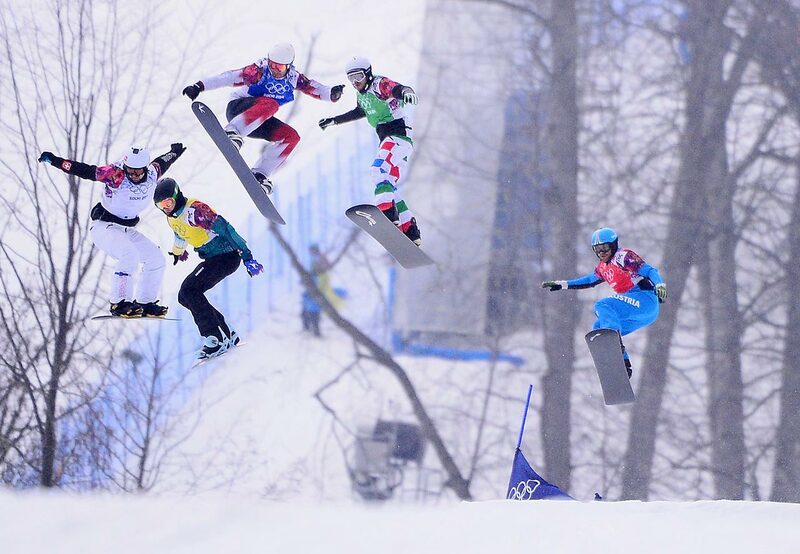 Riders jump during the small final of the men's snowboard cross competition in Sochi. 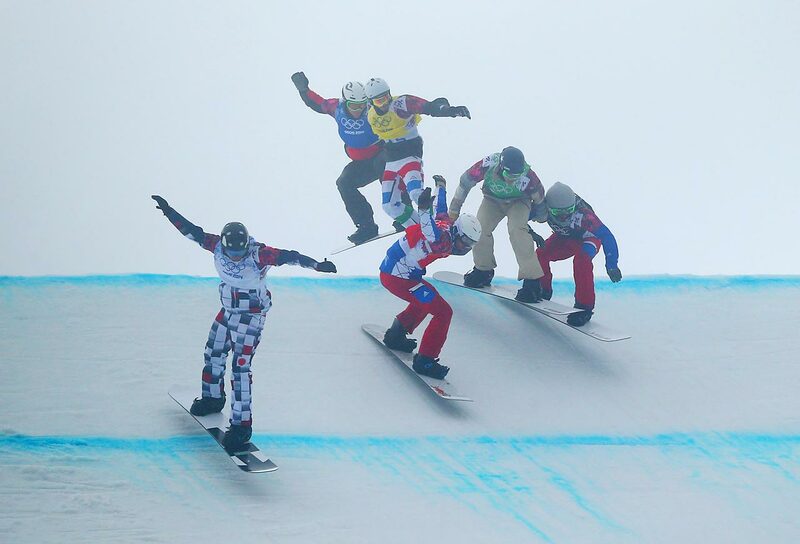 Trevor Jacob of the United States (in red) competed despite hurting his ankle during a semifinal heat. 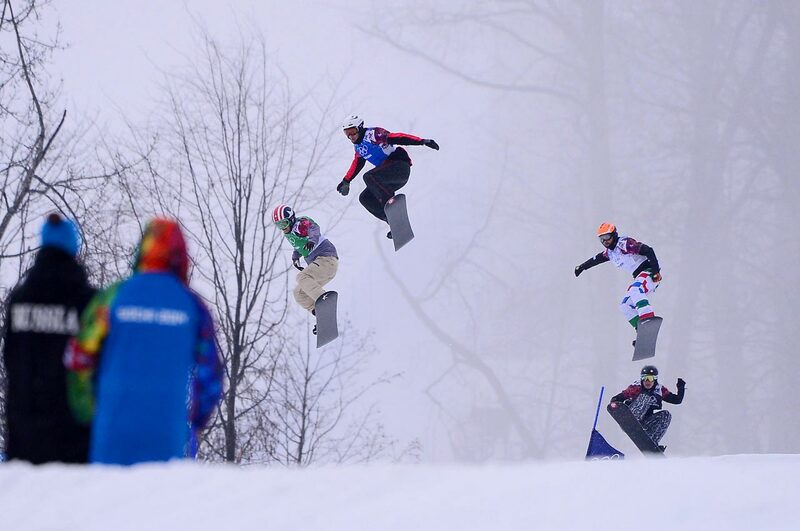 Snowboarders compete in the men's big semifinal of the cross competition. 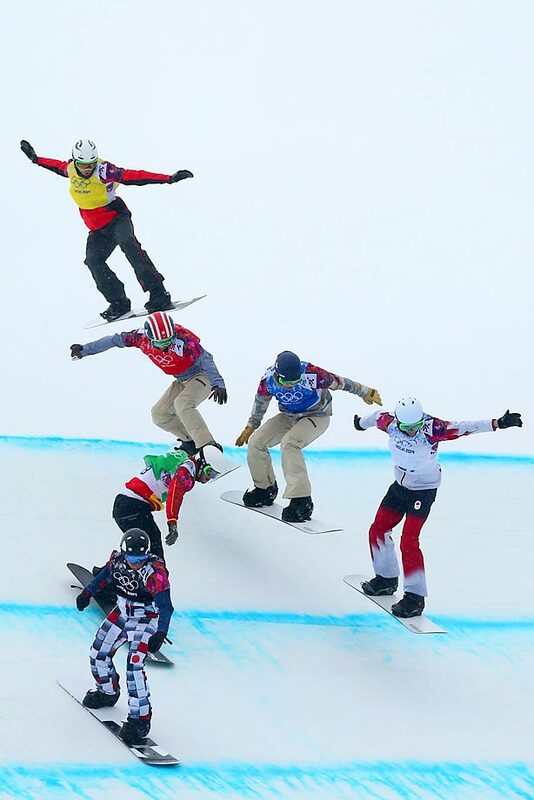 Competitors, including Alex Deibold of the United States (in green), compete in the men's snowboard cross finals. 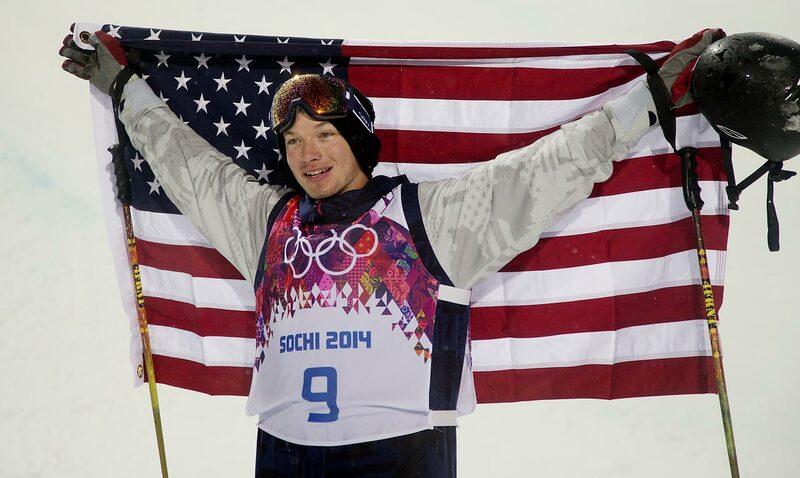 Deibold won the bronze medal. 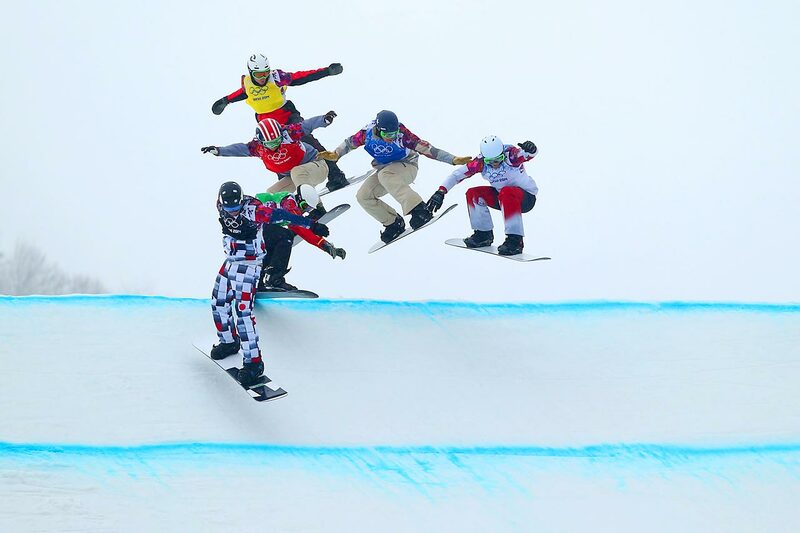 Riders jump during the small final of the men's snowboard cross competition in Sochi. 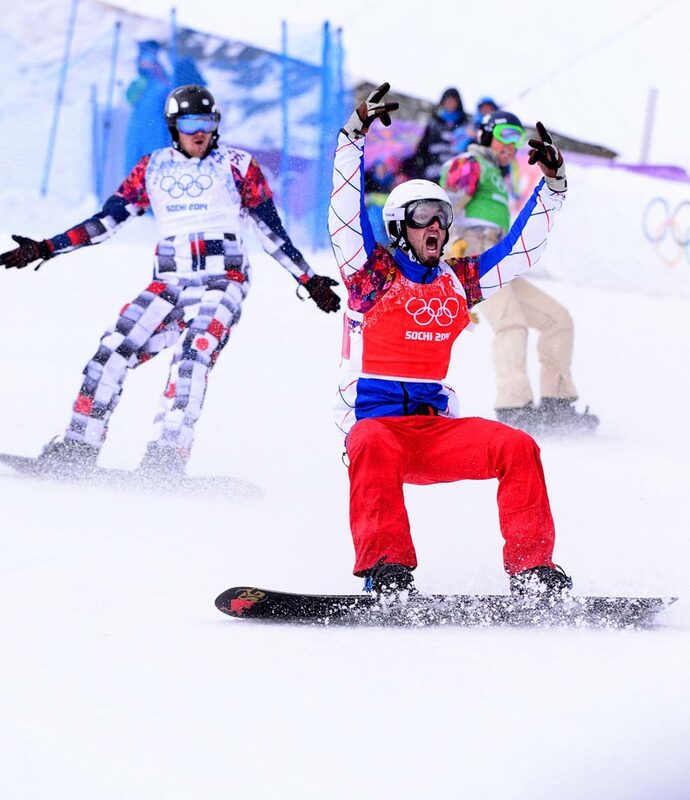 France's Pierre Vaultier claims the gold medal in the men's snowboard cross competition. 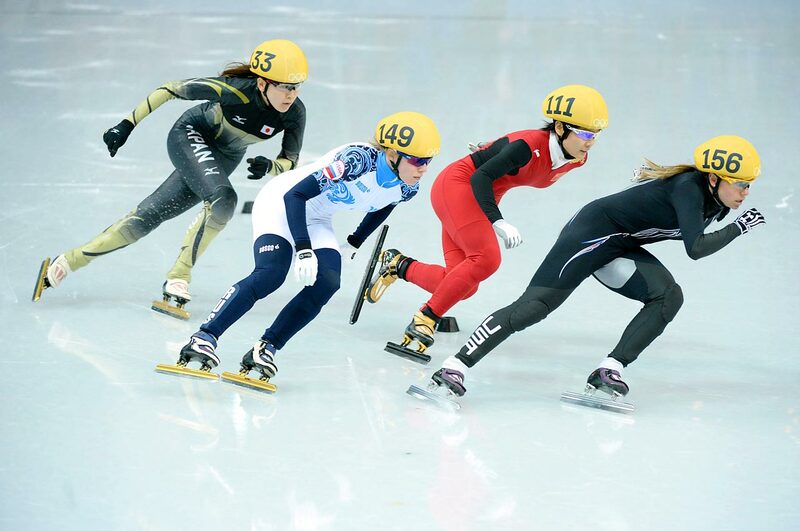 Speedskaters race around the track during the first heat of the 1,000 meter short track competition. American competitor Jessica Smith (right) finished second in the heat and qualified for Friday's quarterfinal competition. 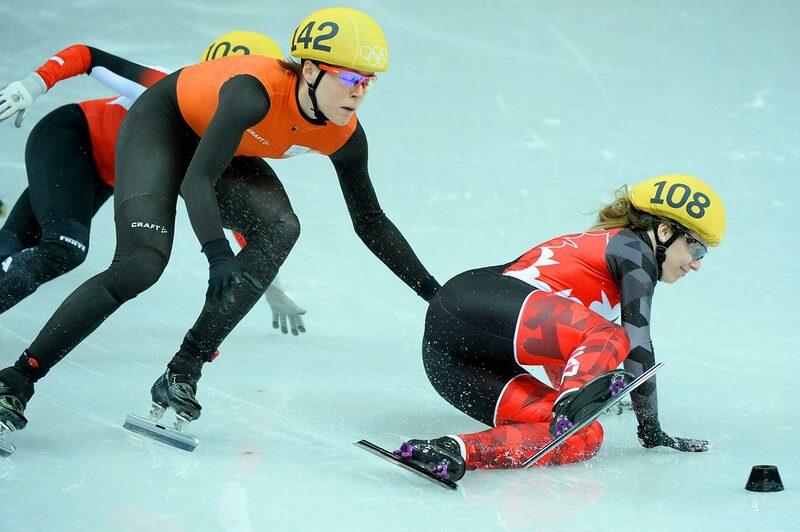 Marianne St-Gelais of Canada crashes during the 1,000 meter short track speedskating competition. 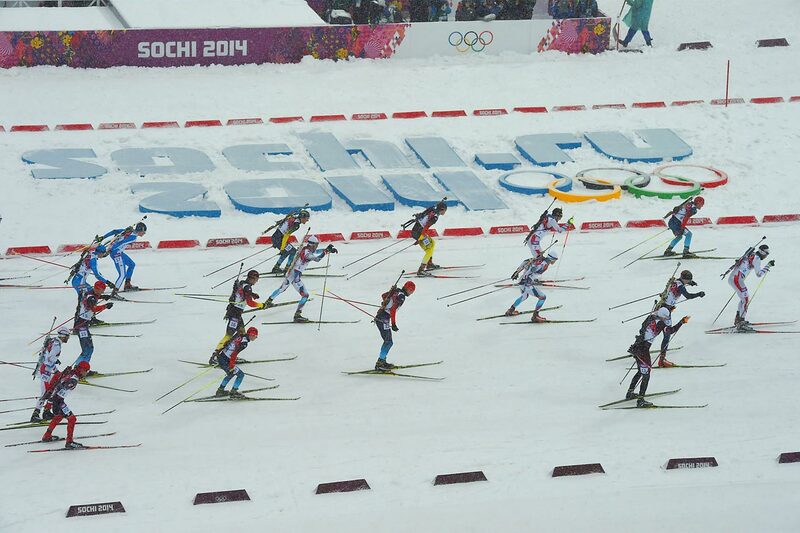 Competitor's in the men's biathlon 15 kilometer mass start race through the course. 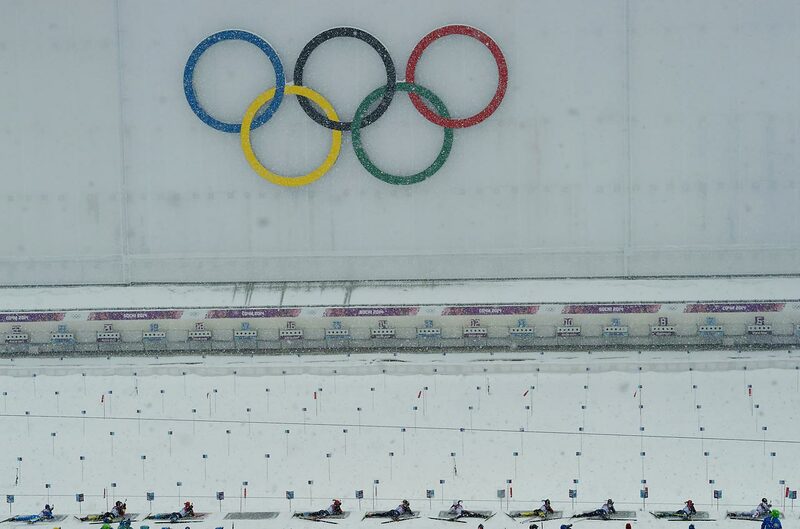 Biathlon competitors shoot during the 15 kilometer mass start competition. 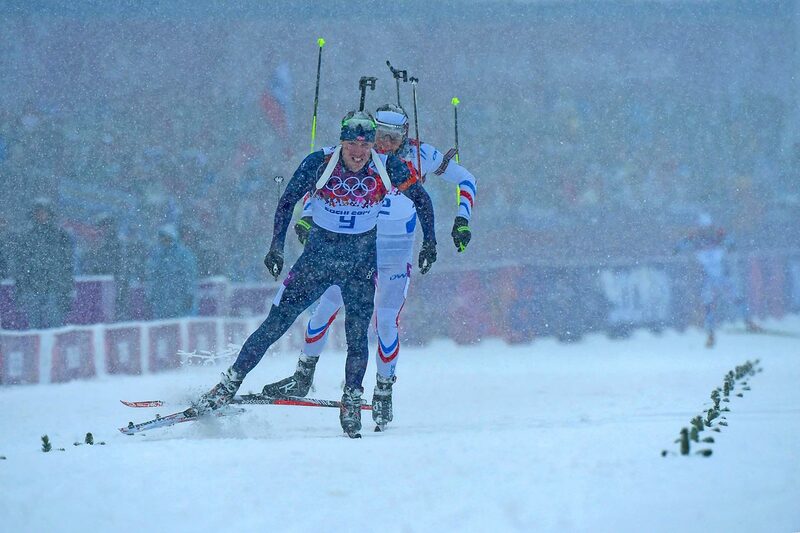 Norway's Emile Hegle Svedsen wins the gold medal in biathlon's 15 kilometer mass start. 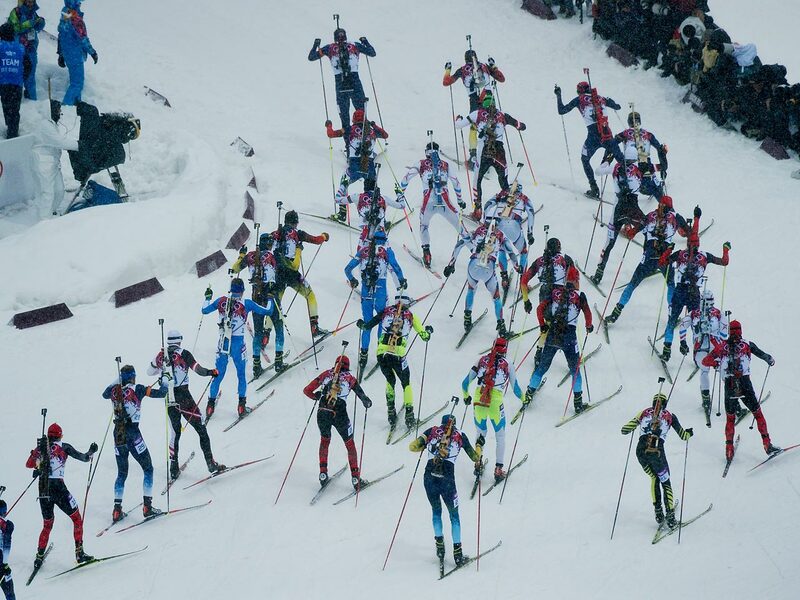 Biathlon competitors race through the course as a pack during the 15 kilometer mass start event. 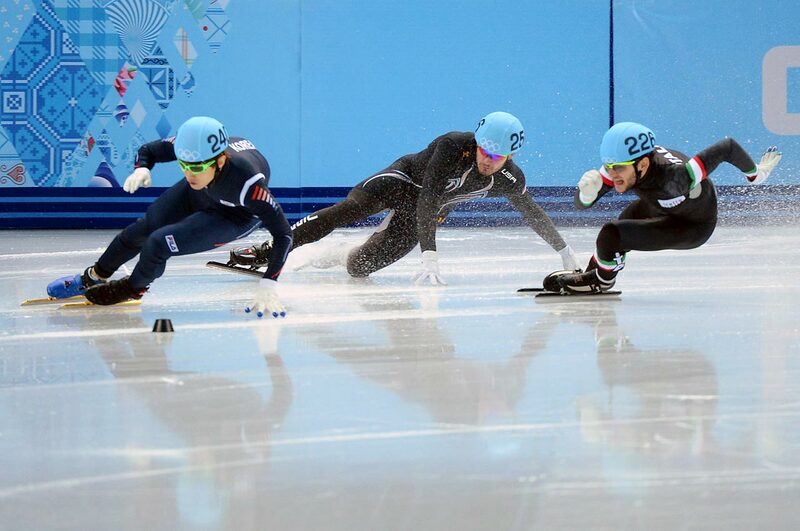 American speedskater Eduardo Alvarez crashes during the 500 meter competition. 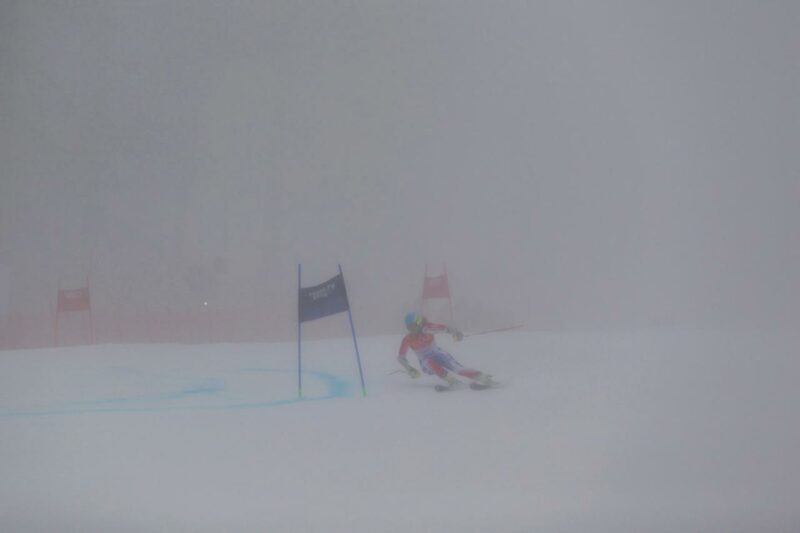 France's Anne-Sophie Barthet maneuvers her skis near a gate in a heavy fog. 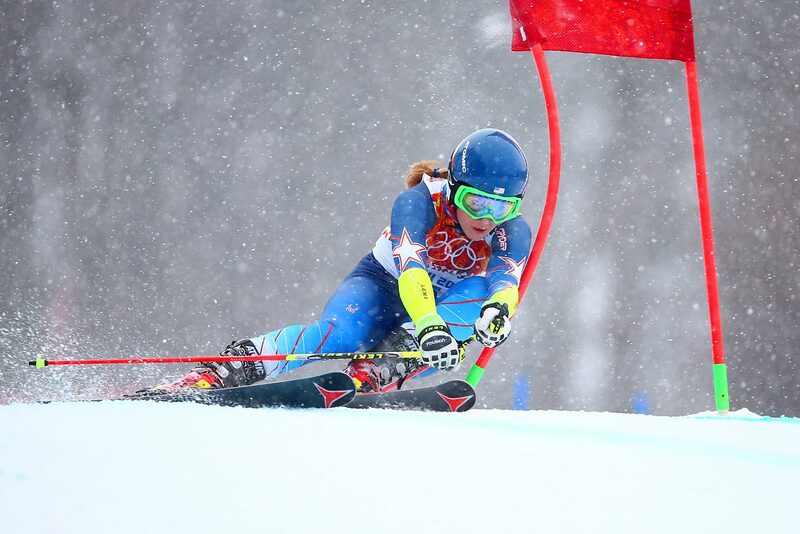 Mikaela Shiffrin of the U.S.
Slovenian skier Tina Maze barrels downhill during the giant slalom. She earned the gold medal for her efforts. 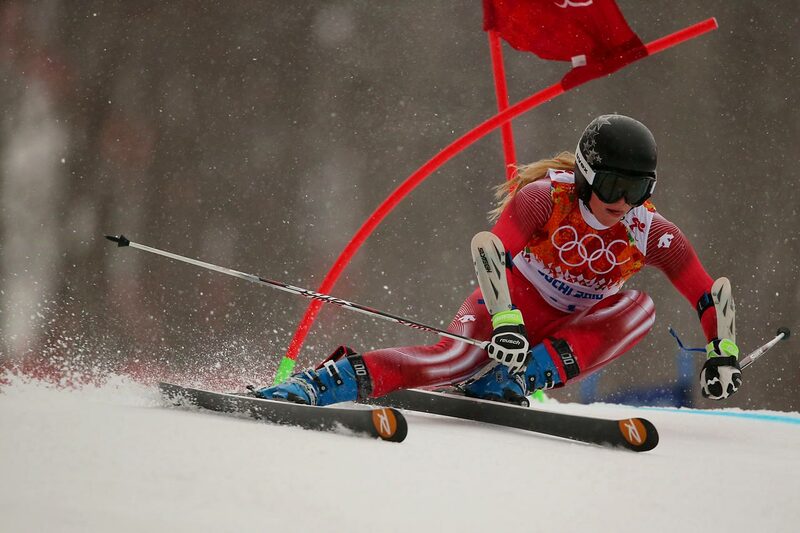 Lara Gut of Switzerland in the Giant Slalom. 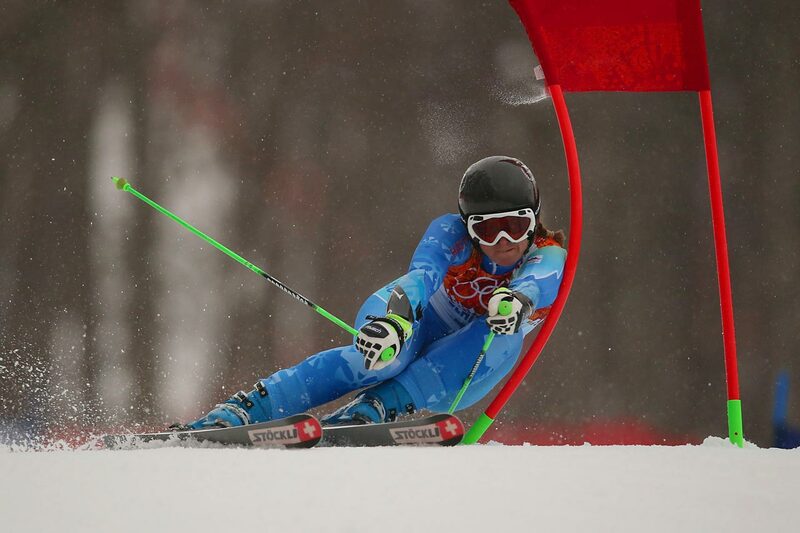 Skier Tina Maze of Slovenia competes during the first run of the giant slalom competition. She finished with the best time. 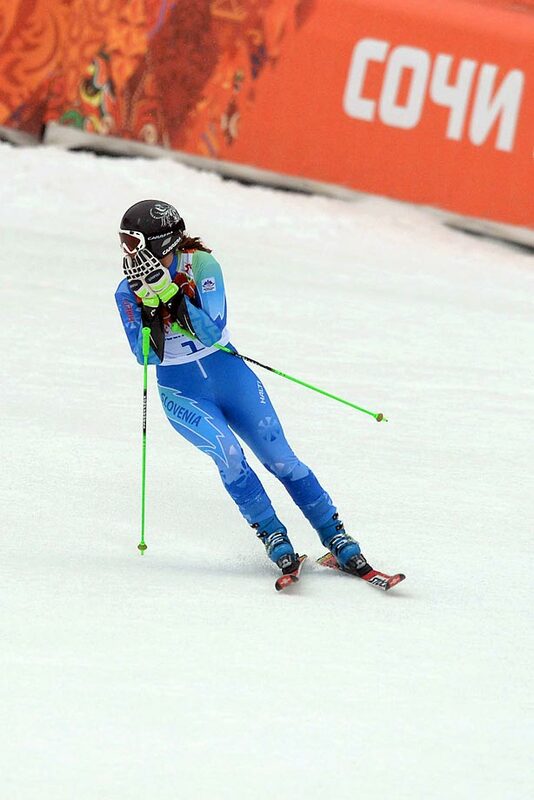 Federica Brignone of Italy dejected after missing a gate.